← 200 "Trash of the Titans"
This article is about the episode "King of the Hill". For other uses, see King of the Hill (disambiguation). The couch is in a snowglobe that is shaken and admired by Homer. "King of the Hill" is the twenty-third episode of Season 9. It aired on May 3, 1998. The episode was written by John Swartzwelder and directed by Steven Dean Moore. Brendan Fraser and Steven Weber guest star. "Crestfallen by Bart's shame of his poor physical condition, Homer sets out to work out. But when a pair of publicity scouts offer him the job of climbing The Murderhorn to promote their product, Homer is too blindsided by lust for physical perfection to turn down the expedition. Guest starring Brendan Fraser as Brad and Steven Weber as Neil." The family goes out to a church picnic. When the kids start a game of capture the flag, Bart chooses Homer to be on his team. Soon, Bart realizes Homer is not physically fit. Moments later, Homer collapses, causing Bart to become disappointed in his father. That night, Homer thinks about how ashamed Bart was in him and, at midnight, he sneaks out to exercise. A later night, Homer is running and decides to stop at the Kwik-E-Mart, where he discovers an energy bar called "Power Sauce", which he starts to eat regularly. 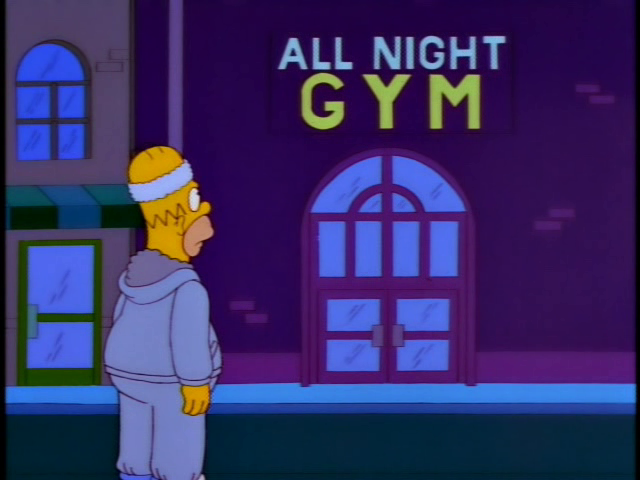 During another one of his late-night runs, he finds a 24-hour gym. There, he meets Rainier Wolfcastle who becomes his fitness coach. Wolfcastle is successful in training Homer and, in two months, Homer is slimmer and has defined muscles. Homer then reveals to the family that he has been secretly working out. 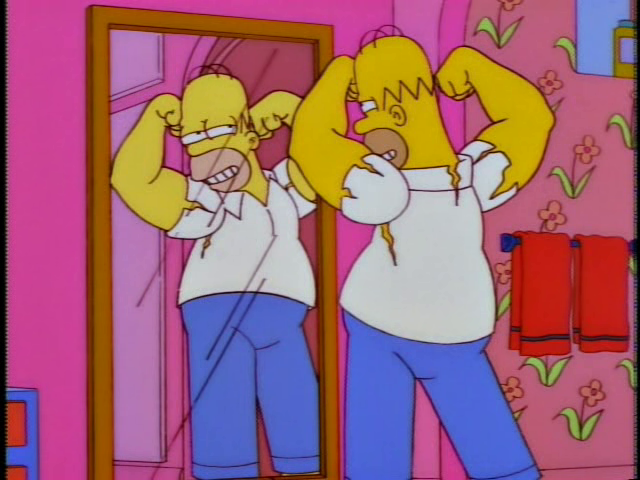 The family is impressed at Homer's improved shape, including Bart. He goes with Homer to the gym one day, where Rainier is being asked by two "Powersauce" representatives to climb the tallest mountain in Springfield as a publicity stunt. 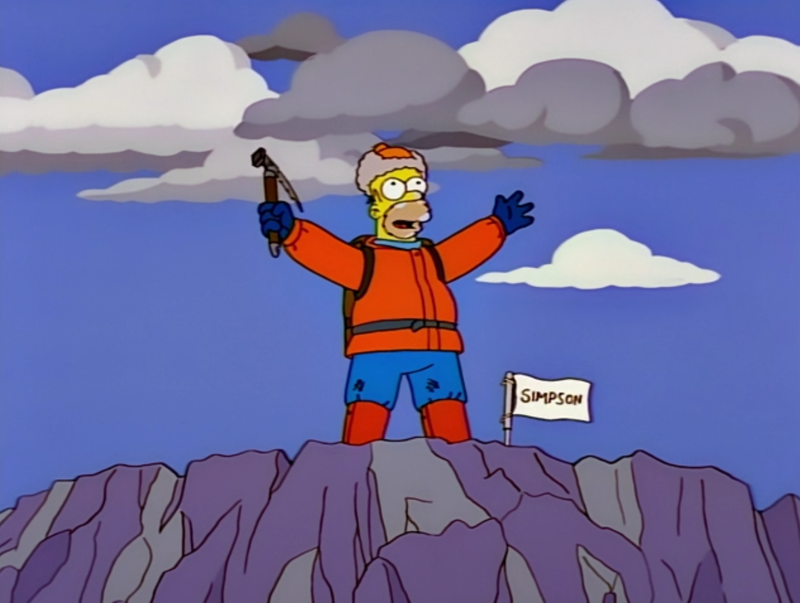 When Rainier refuses, Bart informs them that Homer will climb it, and when he is asked, Homer agrees to do the climb. When he finds out that Homer is climbing the mountain, Abraham Simpson urges Homer not to do it, as he attempted to when he was younger, and was betrayed by his friend C. W. McAllister. Homer ignores him and publicly begins his climbing. He is aided by two Sherpas as guides, who were instructed to drag Homer up the mountain as he slept. During one of these nights, Homer wakes up to discover that he was being secretly dragged, and fires the two Sherpas. After a loss of communication with Homer, many, including the "Powersauce" representatives, predict Homer's death. Homer continues to climb, and when he believes he has reached the top, only sees that he has made it to a plateau of the mountain. Homer enters a small cave on the side of the mountain and discovers the frozen body of McAllister and his diary. Homer reads that it was actually his father that betrayed McAllister, and he even attempted to eat him. Ashamed of himself and his father, Homer climbs out and sticks his flag on the plateau causing mountain's peak to break off, therefore making the plateau Homer was standing on the peak. Proud of his work, Homer uses McAllister's body as a sled to go down the mountain, where he is greeted by a crowd, and once again, causes Bart to be proud of him. The episode was pitched and written by John Swartzwelder. The writing staff had to find a new angle for Homer's weight problems, as the idea had been used several times before. This was emphasized in this episode when Marge does not seem to care that Homer is going to try to lose weight again. In the scenes when the Sherpas were speaking, the show staff went to great lengths to find translations. Originally, the producers of the movie adaption of the book Into Thin Air were contacted to help. They were shocked at the trouble the staff was going to, as they replied that they had simply made up translations in the movie. The staff then had to consult various experts by telephone. The authors of the book I Can't Believe It's a Bigger and Better Updated Unofficial Simpsons Guide, Warren Martyn and Adrian Wood, thought well of the episode, calling it, "A quite charming little adventure in which, in an effort to impress Bart, Homer undertakes a dangerous adventure and comes through successfully. It's nice because just for once, to all intents and purposes, Homer actually succeeds in something." 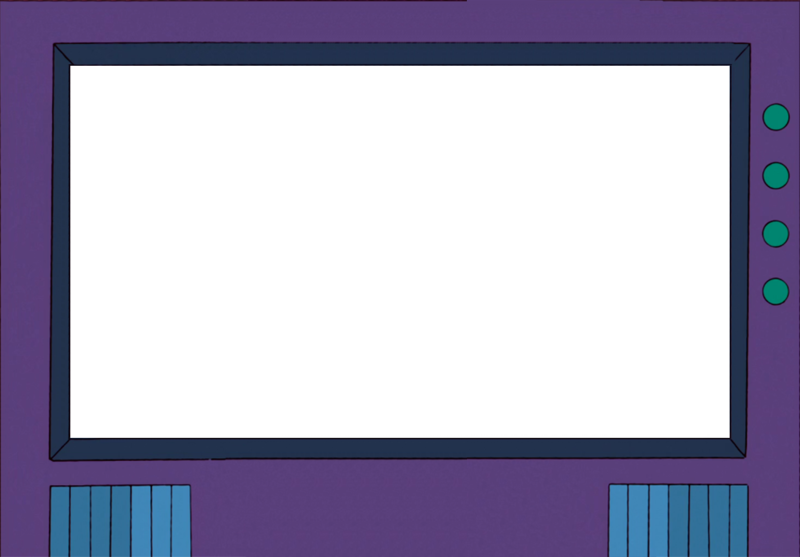 Wikisimpsons has a collection of images related to "King of the Hill". ↑ 1.0 1.1 Scully, Mike. (2006). The Simpsons season 9 DVD commentary for the episode "King of the Hill" [DVD]. 20th Century Fox. Modified on July 9, 2017, at 06:30.